The Ballou Skies Chicago Triathlon Team is in its fifth year. Started by Ryan's cousin, a Chicago resident, it continues the mission of Ballou Skies, raising money and spreading awareness throughout the Midwest. 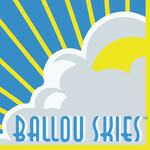 The team competes in triathlons throughout the year, proudly wearing Ballou Skies blue. Each team member raises money for the 501c3 charity.